For Saturn's current position and visibility, see the Planet Wheel. Notes The second largest planet of the Solar System, Saturn is about 83% the diameter of Jupiter, but its bright ring system extends out across a diameter of some 270,000 km, with other less prominent ring structures ranging up to 13 million km from the planet itself. The sixth planet from the Sun, and the second largest in our solar system after Jupiter. Saturn is distinguished by its unique extensive ring system. A schematic chart of Saturn's ring system and the orbits of its inner moons. Moons shown off the main diagonal axis (Helene and Polydeuces, Telesto and Calypso) are Trojan moons, sharing the orbits of the larger moons Dione and Tethys, respectively. Janus and Epimetheus form a pair of co-orbital moons that follow very close orbital paths, and can occasionally exchange orbits with one another. A view of the planet Saturn, showing its famous, unmistakable rings. Use the scrollbar on the right of this window to explore the moons of Saturn, shown to scale. 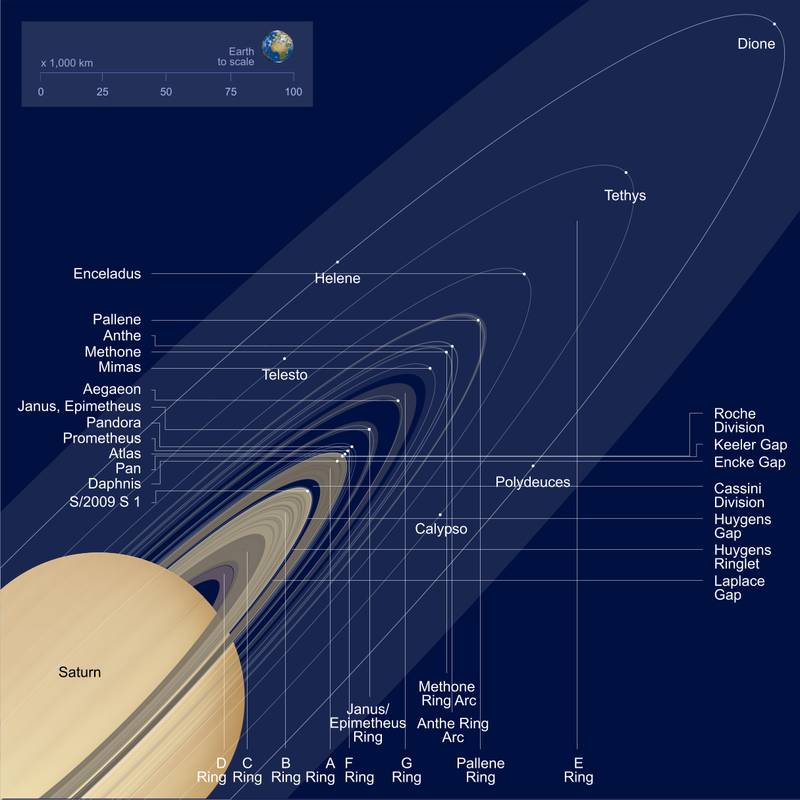 (Values shown are mean distances from Saturn, though note that several of the planet's outer satellites have eccentric orbits). A Saturnian cloudscape. This is a view of the outer layers of Saturn's atmosphere, with the rings visible in the sky.